Don't let winter weather stop you from getting in quality cycling training. 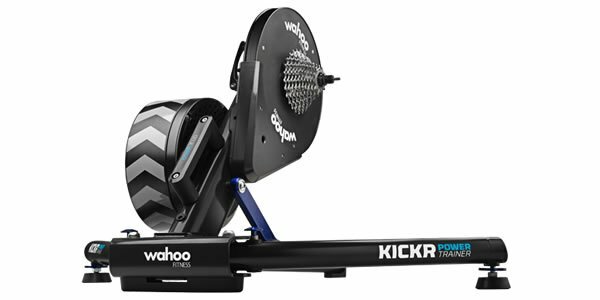 The Wahoo Kickr power trainer is your way to exciting winter training and will get you ready for next season. The Kickr features wireless connectivity via ANT+ and smart Bluetooth, making it compatible with iPhone and Android phones and tablets. Combined the Wahoo Fitness App and Kickr will give a complete system for indoor cycling training this winter. The Kickr is a direct drive system which requires less space in your apartment or condo, the direct drive also means the Kickr requires no rear wheel to operate, saving you the hassle of swapping out a trainer tire. The ANT+ connectivity means all data is transmitted wirelessly, so there are no wires and cables lying around for you to trip over. Download the Wahoo Fitness app for your smart phones or tablet, and you have yourself a training system for cycling at an affordable price. The Wahoo fitness app controls the resistance for power base intervals, or to simulate hill climbs. You can control the resistance manually, or you can use one of the training aps to download a certain course to mimic while you are training. Ever want to know what it is like to ride Alp d’Huez? The course is available for simulation through the Wahoo Kickr. The app also shows current power output, heart rate, cadence, stop watch and timer. If you plan on using all the data from your smart phone, you will need a smart Bluetooth heart rate chest strap and cadence sensor in order to record data. Although the Kickr weighs more than the other indoor trainers, it is portable. If it's nice out and you need a quick ride, but you don't want to deal with lake front crowds, you can move your Kickr out on the deck, and enjoy the nice weather on your bike. Create a play list of ITU races. Most highlight races are about 5 minute long. Create a play list with races long enough for your goal ride. Warm up for 10-15 minutes, about 2 or 3 race highlights. Each of these races will have a swim, bike and run. Swim would be your recovery. Bike at threshold or race pace. Run at anaerobic. Wahoo Kickr with Wahoo Fitness app saves your ride data and you can upload that data to your favorite online training log, Strava, TrainingPeaks, MapMyFitness, and may more. The Wahoo Kicker is simple and easy to use and gives you all the data you need for a complete and quality training regimen.